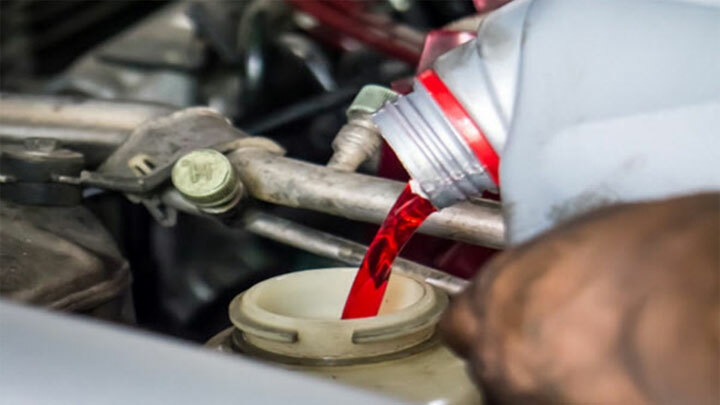 The color of the automatic transmission fluid in your car can help in diagnosing a transmission problem and give you an indication of the overall health of your transmission. Open your vehicle’s hood and locate the transmission dipstick. Pull the dipstick out of the filler tube. Look closely at the fluid on the end of the dipstick to determine the fluid color. If it’s hard to tell, place a few drops of transmission fluid on a clean white sheet of paper to get a more accurate color reading. Match the color with the closest color shown on the fluid color chart below. The below provides an explanation and suggested course of action for each fluid color. 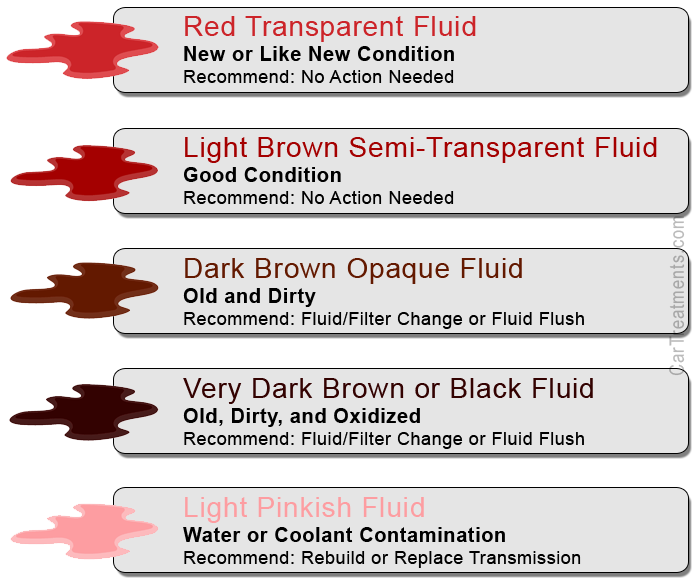 What It Means: This is what new or like new transmission fluid should look like. Keep your fluid in this condition and make sure it doesn’t get low and you will likely never have a serious transmission problem. Recommended Action: Check the fluid condition regularly and follow the manufacturer’s transmission/transaxle service procedures and service intervals. What It Means: Your transmission fluid is in generally good condition. Maintain this fluid condition and watch for leaks and your transmission will probably outlast the rest of your vehicle. What It Means: Your transmission fluid is old, dirty, and contaminated and doesn’t provide adequate lubrication. Poor lubrication causes excessive wear and damage to internal parts. Dark brown transmission fluid also increases heat inside the transmission, which can quickly lead to transmission failure. Recommended Action: Take action now before this fluid condition causes serious problems or even transmission failure. Perform a transmission fluid and filter change or a complete flush of the transmission. What It Means: The transmission fluid is old, dirty, contaminated, and/or oxidized. A burnt odor will confirm oxidization. Recommended Action: Take action immediately. Some internal damage may have already occurred. If your transmission is still working properly, a fluid and filter change or flush should be performed immediately. If problems already exist, a transmission rebuild may be necessary. What It Means: When water or coolant has entered the transmission, the friction clutches fall apart and seals are ruined. The water enters the transmission through a damaged or leaking transmission oil cooler line radiator. Complete failure of the transmission is almost certain. Recommended Action: Unfortunately, you will need to rebuild or replace your transmission. Smell the fluid. If it has a burnt odor, the transmission has overheated and the fluid is oxidized. The result is poor lubrication, increased friction, increased heat and excessive wear or damage to internal parts and seals. In most instances, burnt smelling transmission fluid means some internal damage has already occurred. Place a couple of drops of the ATF on a paper towel and wait about 30-seconds or so. If the fluid has spread out and is red or light brown in color, the fluid is good – No action is needed. If the fluid does not spread out and is dark in color, the fluid is oxidized. In this case, a fluid and filter change or flush is needed.